Sunroom window treatments should enhance the natural sunlight in your sunroom. Select window treatments to complement your sunroom decor and block harmful UV rays that cause furniture and floor coverings to fade. 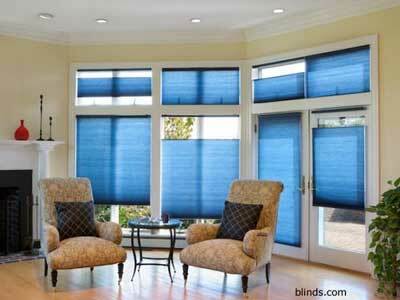 You can choose between sunroom curtains, sunroom blinds, plantation blinds, and many other sunroom window coverings. Mary and I have highlighted some of our favorite options below; select ones that will work perfectly for your sunroom. Some of these options are perfect for front porches too! These are also known as interior window shutters and usually hinge on either side of your window frame and swing inwards. Plantation shutters can be opened to allow maximum light into your sunroom or closed for privacy and they are designed to complement all sunroom decors. Note the shutters on the skylights! For a more traditional appeal nothing beats wood; however, wood shutters usually tend to be more expensive. If cost is an issue, consider faux wood shutters (almost 40% less expensive). They are also resistant to moisture and mildew. One of the nice features of plantation shutters is that you won't need a valance or draperies! 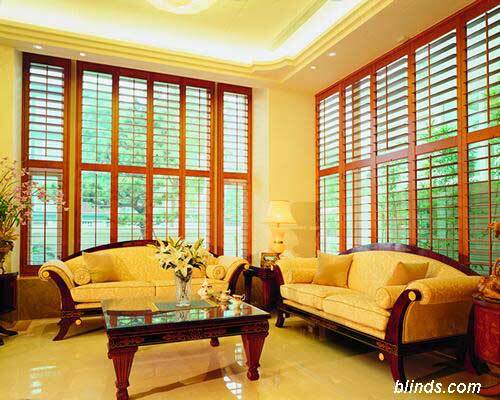 If you're looking for plantation shutters, we found them at Blinds.com - we think you will be surprised at both the value, selection, and their customers' five-star reviews! 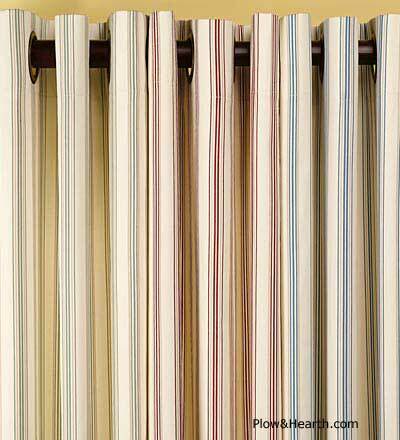 We have purchased blinds for our own home here and liked their quality ad the service we received. 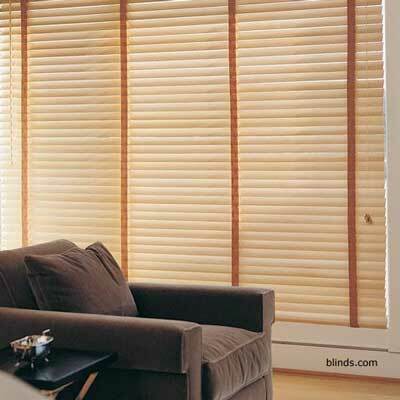 Choose window blinds with either light blocking or light filtering functionality. 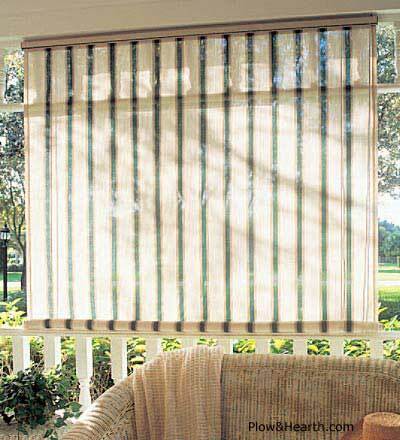 If looking for elegant window treatments for your sunroom, be sure to see these vertical soft shadings. 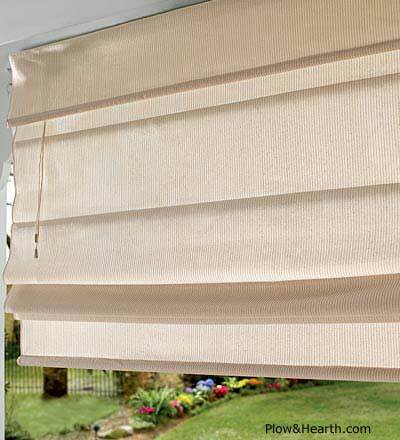 Like in the photo below, they combine vertical blind vanes and soft sheers - quite the look for any sunroom. Wood: Choose wood with a no-holes routeless option to keep the maximum amount of light from entering your room. Some are motorized while others are cordless; a great option around children or pets. 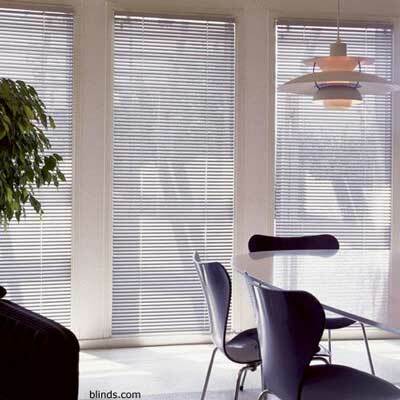 Aluminum: Less expensive than other blind options, aluminum blinds are also popular. We recommend the no-holes option for better light control. Curtains are excellent decorating tools. 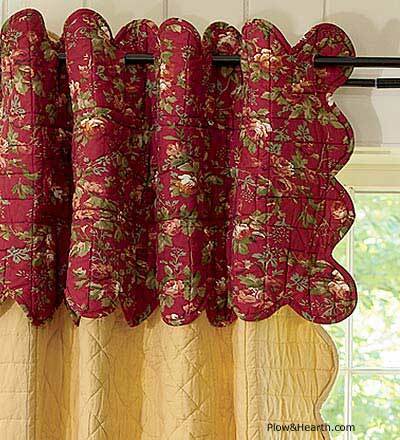 You can use sunroom curtains by themselves to create a very romantic look. Thick curtains can help reduce drafts while thin ones draped over curtain rods create a more carefree and whimsical look. 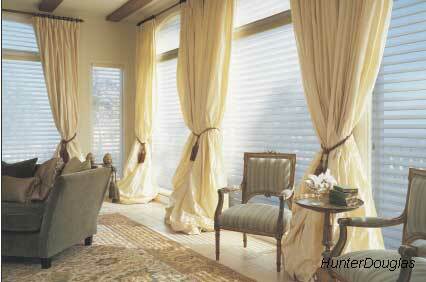 Consider using outdoor curtains as sunroom window treatments. They come in variety of fun colors and patterns that will brighten any sunroom. Always popular, these Coolaroo ® shades are energy efficient. They block 90% of harmful UV rays yet breath to allow air flow and reduce inside temperatures. What's also nice is they receive glowing recommendations from purchasers. Sophisticated and elegant, these Roman solar shades use high quality materials to create shades that are sleek and functional. But that's not all. Because of their their distinct tight weave, these shades also function as solar screens to control glare and UV penetration - ideal qualities for sunroom window treatments. Really take a look at these: top down bottom up shades for your sunroom. The unique design allows you to raise or lower from the bottom or from the top. This gives you the option of privacy when desired without losing sunlight or your view. On top of that they are cordless which makes them ideal for anyone with children or pets or those who want a clean unfettered look. 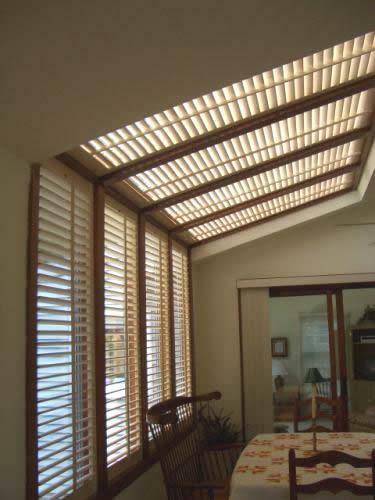 Fabric vanes are suspended between two sheers to create beautiful lighting effects in your sunroom. They come in a myriad of colors. Sunroom window treatments have to include stained glass panels. The panels allow sunlight to spread a warm array of colors throughout your room. 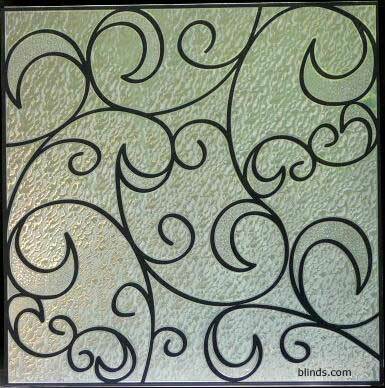 Stained glass appliques are ideal alternatives to stained glass panels as sunroom window treatments. 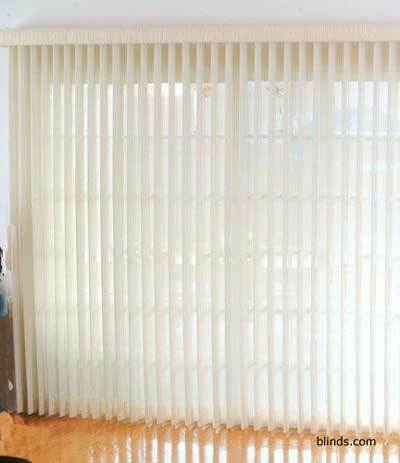 They are easy to install window treatments that add beauty to any window. They have a definite texture and the "bevels" appear as they do in leaded glass. They have UV inhibitors to help prevent fading and discoloration of your flooring and furniture and can help to reduce summer heat while retaining warmth of the winter sun. Of all the sunroom window treatments, window quilts may well have the best insulation qualities that can cover large expanses of glass. Because the quilts are sealed,there is almost no cold air infiltration. Usually made of layers of polyester and mylar, the quilts easily roll on a track and can be spring or cord operated. They also work well on sloped windows and skylights. Anyone who has skylights knows how much heat and how harmful UV rays affect your furniture. Skylight shades will keep your room cooler and look great too. Skylight shades permit light diffusion meaning you will have minimal glare on video appliances like televisions and computer screens. For larger expanses you may be able to mount them side-by-side for more coverage.